1 of your 5 a day and quick to prepare. Preheat the oven to 190c, gas mark 5. Melt the oil and butter together in a frying pan and add the leek and garlic. Cook gently for 5 minutes until softened but not coloured. 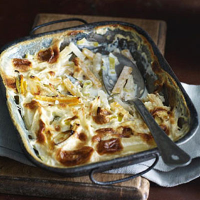 Combine the leek mixture, potatoes and swede in a buttered 1.5 litre shallow ovenproof dish and season, layering in the bay leaves as you go. Mix the cream and milk together and pour over the vegetables. Bake for 1 hour until the vegetables are tender and the top golden. Cover with foil if the gratin browns too much. Serve with a salad or steamed broccoli. Use shredded kale or shredded Savoy cabbages an alternative to leek.